This is the first post in a series about my recent trip to Japan. 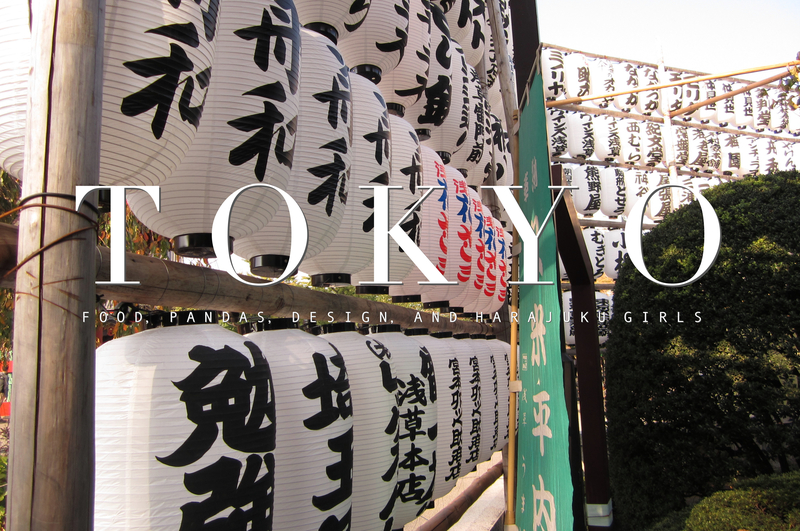 Just like the first stop on my trip, the first post in this series will be about Tokyo! I got very excited about my trip when planning where to go and what to do, but not necessarily about Tokyo. I'm not sure why, but I guess I thought it would just be an overwhelmingly large city which I would want to escape after a couple of days. But nothing could be further away from the truth. I fell in love with Tokyo. Head over heels! It could be that I'm just very used to living in a noisy, and busy city (London), but Tokyo didn't seem hectic to me at all. In fact, I thought it was pretty quiet for such a massive metropole. Moreover, I found Tokyo very clean: no trash, no graffiti, no weird smells in the tube. The people were very polite as well, which made, amongst other things, travelling by public transport a lot more pleasant. We stayed in the area Asakusa, very close by the Senso-ji temple, in two lovely hostels. The first one was Nui Hostel, which is a really cool hostel with a stylish interior and good coffee, and the second one was Khaosan Tokyo Kabuki, where the staff is really kind and helpful. The temple is the main attraction in this area and so it was quite touristy during the day. Asakusa has lots to offer when it comes to restaurants. On the first day we had dinner at a sushi-train restaurant, (sushi train is"kaiten-sushi" in Japanese), which was delicious. If you don't speak or read Japanese I highly recommend going to a sushi train restaurant, because you can see what the food is and pick it up yourself. We had another great dinner experience at a restaurant called "Sometaro". It's a restaurant with low tables with hot plates in them, so you have to prepare your meal yourself. Their speciality is Okonomiyaki, a savoury pancake with various ingredients, which is now one of my favourite Japanese dishes. On the second day in Tokyo we went to Ueno, where we visited the zoo and Tokyo National Museum. Overall, the zoo was not that amazing, but they do have two giant pandas that are definitely a must-see if you love pandas as much as I do ;) The National museum on the other hand, is absolutely worth a visit. The museum has a special highlights section which shows items that are typical for Japanese culture and art. I was personally most impressed by their collections of Kimono's and Samurai harnesses. Of course, I couldn't leave Tokyo without going to the shopping area and trying to spot some "Harajuku girls", and I actually got quite lucky. We went to the big department store LaForet where there happened to be a special event with some kind of Japanese celebrity and so there were a lot of girls dressed up in the most fantastic, crazy, cute outfits, queuing to get a signature. It was really interesting to see how they were all dressed up. The store itself was pretty amazing too. It's made up of various small stores that each sell very unique clothes and accessories. I think shopping in general is really nice in Tokyo, it's not necessarily cheap, but they sell things you won't find that easily in Europe. Also, Japan is really big on vintage stores, and in Tokyo you'll find stores, such as RAGTAG, selling vintage items from brands like Vivienne Westwood, Acne, Dries van Noten and even Chanel, and Louis Vuitton. If busy shopping streets are not really your thing, you should go to Cat street, which is just off Omote-sando. In this street you'll have more space to move and you can find a lot of unique boutiques. Another area of Tokyo I really liked was Roppongi. We went there to see an exhibition about Frank Ghery in 21_21 Design sight, which is a design gallery/workshop created by Issey Miyake and Tadao Ando. Both the exhibition and the building were really cool and if you like design I would recommend you going to Roppongi. The part of the area we walked through was very much focussed on design. The architectural style is very modern, with a lot of glass and wood, and in the parks you can find some interesting statues and fountains. I have also heard that Roppongi is a good area for going out, so even if you don't care too much for architecture, you might want to check this area out. Tokyo is a really interesting city and I definitely want to go back to do and see more. If you get a chance to go there, I would recommend getting a good travel guide (such as the Lonely Planet) and find out for yourself what areas you would like to explore. You should also buy a Tokyo Subway pass, which is quite cheap and the subway is most definitely the easiest and fastest way to get around Tokyo. The next post in this series about my trip to Japan will be about Kyoto.